[Excerpt from a published film review]: With their sweet faces and absurdly proportioned bodies that can nevertheless bound with matchless grace, what is not to love about the kangaroo? And yet, this creature is deeply reviled—and even slaughtered—by quite a number of souls Down Under, who see them as nothing more than mere pests—great rodents, in the words of some—who destroy valuable farm and ranch lands. Mick McIntyre and Kate McIntyre Clere examine this dilemma in their impassioned doc Kangaroo: A Love-Hate Story. Though it voices both sides of the conflict, there can be no doubt that their allegiance lies with animal welfare. It’s ironic that the very symbol of Australia, with its image emblazoned everywhere, an integral part of a touristic promotion, should inspire such deep hatred and cruelty. Watching the film, you are continually torn between having your heart race as you see these magical marsupials in action and broken when you’re presented with the bloody evidence of their slaughter, which some viewers may be quite unable to take. Aboriginal elder Uncle Max Dulamunmun Harrison, interviewed here, calls them “the first Australians.” But since their population is actually larger than the country’s 25 million human inhabitants and they eat up valuable pasture land, “mitigation” licences are granted to farmers and hunters, making this the biggest legal animal slaughter in the world of, mind you, a protected species. And it gets worse: Although a single bullet wound to the head is decreed by law as the most merciful death, archival footage (shot by longtime activists Diane Smith and Greg Keightley) exists of hunters bashing away at their heads and even pulling babies (joeys) out of the pouches of their dead mothers. Kangaroos are routinely trapped into fenced-off corners where fish-in-the-barrel bloodbaths begin. Profits are made out of their hides for fashion and meat for cuisine. Mark Pearson, the first Australian politician elected from an animal-rights party, is featured here, along with his investigations regarding kangaroo meat industry hygiene that resulted in it being banned abroad. Sad but unsurprising, threats were made against Smith and Keightley, another outrage covered by the McIntyres in their expertly photographed and edited doc. The co-existence of kangaroos with Australia’s essential sheep and cows is indeed a huge problem, but it is to be hoped that with the release of this film and the anger it will undoubtedly bestir, the dilemma can be addressed in a sane and humane way. Note: It is notable that the film represents one of a spectrum of views regarding kangaroos. 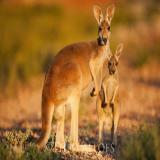 Farmers, for example, may view the impacts of kangaroos differently than that represented in the article. From a legal perspective, the actions referred to in the article are currently lawful. This raises questions about activities which might change following public awareness, acceptability, and application to other species. This is illustrated, for example, in New Zealand where legislation has specifically addressed issues of killing animals by blunt force trauma has been specifically addressed following public concerns regarding the practice in the dairy industry.